Chlorhexidine is often called the ‘gold standard’ in antiplaque agents. It is a molecule with a stellar track record: having been used for over 60 years in more than 50 different and diverse medical applications as an antiseptic, antimicrobial and antibiofilm agent. Chlorhexidine was discovered serendipitously in the 1950’s, during antimalarial drug research. First commercialized in 1954, it has been used in pre-surgical handwashes, showing almost 80% reduction in skin bacteria, as an antimicrobial coating agent for medical devices; catheters, dressing sponge and skin preparation cloths. How safe is Chlorhexidine ? The very high safety is an important feature of Chlorhexidine. It has shown minimal potential for carcinogenesis, has very low absorption from the gastrointestinal tract and its long-term usage produces no changes in blood, metabolic, liver or renal function parameters. Owing to these, Chlorhexidine can be used for long periods of time without adverse effects of cross-sensitization or change in commensal flora, especially beneficial in vulnerable patient populations who require long-term antimicrobial or antiplaque agent usage. The oral health application of Chlorhexidine as a mouth-rinse was first introduced in 1976, as the ChlorhexidineGluconate salt. In long term studies, it has shown reduction of dental plaque and gingivitis by more than 40%. To this day, it remains the safest documented chemical antiplaque agent with a high efficacy. One of the most important feature of chlorhexidine is its property of ‘substantivity’. The Chlorhexidine molecule being basic in nature, adheres to tooth and oral mucosal surfaces bearing negative charges. This causes it to slowly release over an extended period, with significantly effective levels upto 12 hours, imparting a very efficient antiplaque ability. About thirty percent of Chlorhexidine is retained in bound form after rinsing and it remains detectable in saliva after a day. It is currently used predominantly in the form of 0.2% mouthwash. A 0.12% mouthwash, 1% Chlorhexidine gel and 0.2% spray, a local drug delivery form for placement in periodontal pockets and chewing gum forms are also available. Does Chlorhexidine have any side-effects? The major side-effect of Chlorhexidine is a brown staining of teeth upon long term use; a side-effect common to other cationic antiseptics owing to precipitation of pigmented, tannin like dietary chemicals such as in tea, coffee, wine etc. when they bind with the Chlorhexidine adhered to tooth-surfaces. Another side-effect can be formation of more supragingival calculus. This may be as it selectively suppresses the more acidogenic bacteria, leading to a rise in local pH on the tooth and more calcium, phosphate precipitate to form calculus. As these effects are importantly dose and time dependent, they led to formulation of the 0.2% concentration which best optimizes sufficient antiplaque efficacy while maintaining a low propensity for substantial staining. For the same reasons, Chlorhexidine also tends to bind to sodium lauryl sulfate from toothpaste and hence patients should be advised to rinse with chlorhexidine mouthwash after a gap of 30-60 minutes from tooth brushing. When to prescribe 0.2% Chlorhexidine mouthwash ? those who cannot perform tooth brushing such as handicapped individuals. How to use 0.2% Chlorhexidine mouthwash? Patient is instructed to use chlorhexidine gluconate mouthwash twice daily after brushing teeth. Remember to instruct to keep a gap of 30 min from tooth brushing. 10 ml of mouthwash is swished in mouth for at least 60 seconds, then spit it out. Do not swallow the mouthwash. Avoid eating and drinking immediately after mouthwash to nullify its effects. 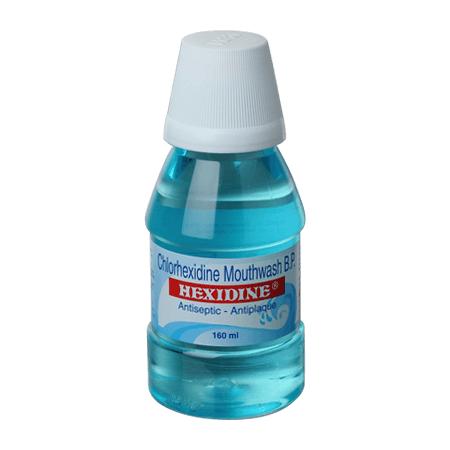 Hexidine mouthwash (ICPA) is a 0.2% Chlorhexidine gluconate I.P. is effective and readily available agent for wide range of situations. Rethman MP, Beltrán-Aguilar ED, Billings RJ, Hujoel PP, Katz BP, Milgrom P, Sohn W, Stamm JW, Watson G, Wolff M, Wright JT, Zero D, Aravamudhan K, Frantsve-Hawley J, Meyer DM; American Dental Association Council on Scientific Affairs Expert Panel on Nonfluoride Caries-Preventive Agents. Nonfluoride caries-preventive agents:executive summary of evidence-based clinical recommendations. J Am Dent Assoc. 2011; 142(9):1065-1071.
van Steenberghe D, Avontroodt P, Peeters W, Pauwels M, Coucke W, Lijnen A, Quirynen M, Effect of different mouthrinses on morning breath, J Periodontol,2001; 72(9):1183-1191. Kalaga A, Addy M, Hunter B: The use of a 0.2% chlorhexidine spray as an adjunct to oral hygiene and gingival health in physically and mentally handicapped adults.J Periodontol 1989, 60: 381–385.